This past weekend I spent 3 long, sweaty days traipsing the halls of Expo West, the largest natural products trade show in the world. I’ve been going to Expo West (and its East Coast counterpart, Expo East) for years now, but this year I was simply blown away by the number of companies exhibiting AND the number of companies releasing top-notch products with whole, minimal ingredients. Stay tuned tomorrow, I’ll be posting an entire recap of the show and all of my favorite products! I decided to make these with Lily’s Chocolate (who I also saw at Expo! ), which is sweetened with stevia. I’ve been a fan of Lily’s for a long time and their chocolate is pretty awesome, even if you’re one of those anti-stevia people. I don’t mind a little bit of real sugar in my dark chocolate, but sometimes it’s nice to stick to lower sugar options. 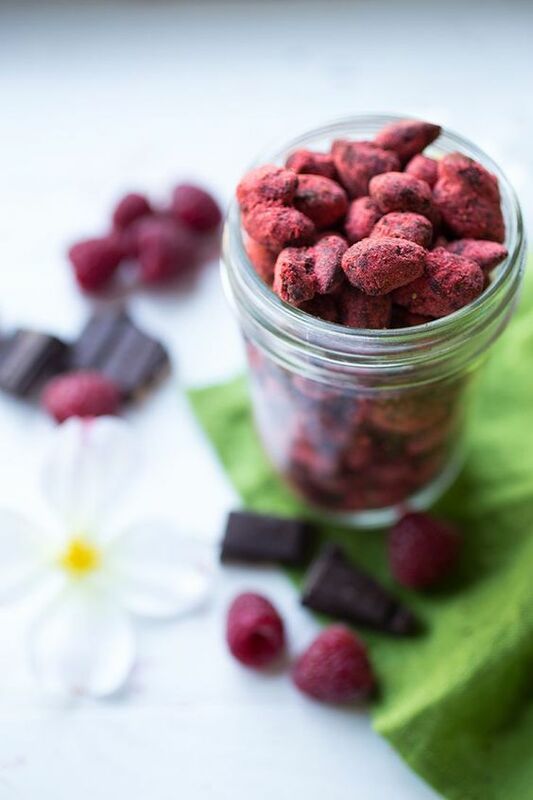 These Raspberry Chocolate Almonds will be delicious with any kind of chocolate, milk, dark or white! In a double boiler, melt chocolate, ghee and vanilla. 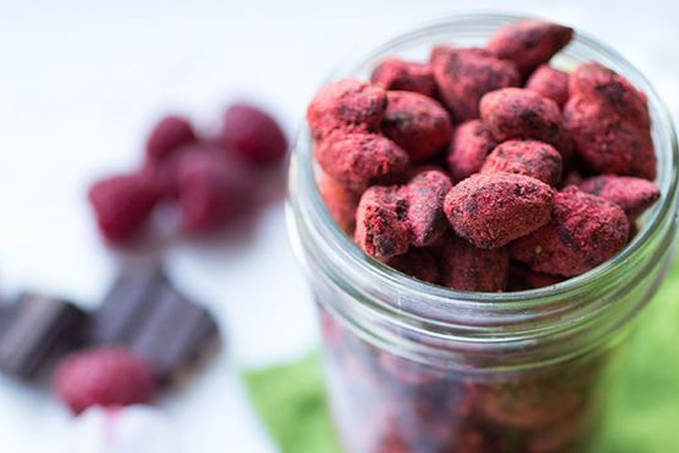 While chocolate is melting, add raspberries to a high-powered blender and mix until most of the seeds are pulverized. You won't get every one, but this will help to minimize them. Pour raspberry powder into a medium sized mixing bowl and set aside. Pour roasted almonds into melted chocolate and stir to coat each almond thoroughly. Place a baking rack on top of a parchment lined baking sheet. Pour almonds on top, spreading them out and making sure they aren't touching one another. Do the best you can, it doesn't have to be perfect! Remove and gently scrape the almonds off the rack into the mixing bowl with the raspberry powder. Place saran wrap on top of your bowl, seal it securely and shake the bowl, mixing the almonds side to side and upside down, until each almond is coated in delicious raspberry! If not eaten right away, these store best in the fridge.